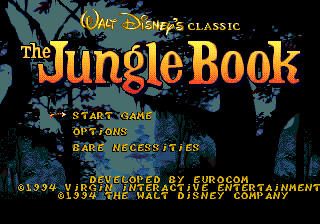 The Jungle Book is a licensed video game based on the Disney film with the same name. It follows the established formula of requiring the player to collect a set amount of items in order to clear a stage, as also seen in Global Gladiators, The Ottifants and Cool Spot. Animations and sprite artwork are of high quality in a similar fashion to the aforementioned games developed by Virgin. This was because development of the Mega Drive version was actually started by the Virgin Games USA development team lead by famous programmer David Perry, but before game's completion they were switched to work on Aladdin instead. When Aladdin was completed, Virgin wanted the team to go back to The Jungle Book and finish it, but they ended up leaving the company to form Shiny Entertainment and do work that would later result in Earthworm Jim. Eurocom was then contracted by Virgin to finish the game and develop most of the other game versions. As with many Virgin Interactive published games, the game was partially PAL optimized by speeding up music but leaving the gameplay untouched. The game's music plays too fast when it's forced in 60Hz mode. Virgin Studios Coordinators: Harvard Bonin, Barry Pringle Sr.
(c) 1994 The Walt Disney Co. Licensed by: Sega Enterprises, Ltd.
Main article: The Jungle Book/Magazine articles. Main article: The Jungle Book/Promotional material.